China is increasing engagement with Latin America, but the relationship’s potential remains limited. The First Ministerial Meeting of China-CELAC Forum, held in Beijing in early January 2015, was undoubtedly a successful one. More than 40 ministerial-level officials from 33 member states of CELAC participated in the meeting, while the heads of Venezuela, Ecuador, Costa Rica, and Panama attended the opening ceremony. Panama’s President, Juan Carlos Varela, suggested elevating the next meeting to heads of state and government level. The meeting launched three outcome agreements, including the China-Latin American Countries and Caribbean States Cooperation Plan (2015-2019). China signed a $20 billion joint project loan agreement with Venezuela and a $5.3 billion loan agreement with Ecuador. Beijing also agreed to establish special economic zones in Costa Rica. Additionally, President Xi Jinping pledged in the opening ceremony that China will provide 6,000 scholarships and 6,000 training opportunities to member states of CELAC in five years, and will invite 1,000 party leaders from Latin America to China, as well as training thousands of Latin American youth leaders through the “bridge of the future” project. So far, the pledges that Chinese President Xi Jinping made during his visit to Latin America last July have been successfully fulfilled. China’s “One Belt, One Road” (OBOR) strategy strategically targets developing countries. 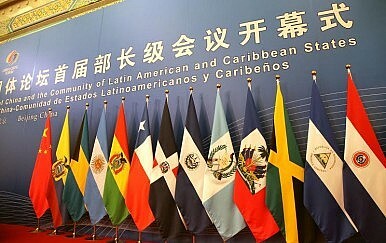 As the China-CELAC forum was held at the beginning of the year, the Chinese government considered this forum “the first international event of its all-around diplomacy.” The forum launches a new cooperative mechanism between China and developing countries, following its cooperation with Africa, the Arab League, the Gulf Cooperation Council, and ASEAN. With the establishment of the China-CELAC forum, China has covered all its bases, setting up cooperative mechanisms with groups of developing countries all over the world. The next step will be to strengthen each cooperative mechanism and to enhance the level of cooperation — for instance, expanding the business forum into a comprehensive forum. China has experienced a diplomatic transformation. In practice, Chinese diplomacy has evolved from “keeping a low profile” to “proactive and enterprising,” as Zhao Kejin and Yan Xuetong put it. Xu Jin described the change as a switch from practicing diplomacy toward great powers to practicing diplomacy as a great power. China’s OBOR foreign policy is a result of these changes. So what is Latin America’s role in China’s international strategy? Will it become another important destination of the 21st Century Maritime Silk Road, just like Africa? Culturally, Latin America has been part of Western civilization. Geographically, it borders the U.S., thus the regional economies are closely tied to the United States’. Some Latin American countries rely on the U.S. for security or are deeply influenced by the U.S. Meanwhile, the U.S. considers Latin America as its “backyard” and has a great impact on, or even dominates, some Latin American countries’ domestic and foreign affairs. U.S. influence is wielded through the Organization of American States (OAS), the Inter-American Development Bank, bilateral economic cooperation and assistance, multinational corporations, military aid, and even military intervention. When it comes to Latin America and the Caribbean, U.S. tolerance for China to expand partnerships and economic interests within this region is one thing; the development of military and security ties is quite another. Conversely, China could set up security and military alliances with African states if necessary, as that continent is far less influenced by the U.S. and Europe. Both Latin America and Africa are less important than Eurasia in China’s OBOR strategy. And the China-Latin America relationship is of less significance than China-Africa ties, considering the factors of geographical distance, the United States’ great influence, weak economic ties, cultural differences, and a lack of ground transportation. Additionally, the relationship between China and Africa has developed for more than half a century, while economic ties between China and Latin America have only developed in the past two decades. Furthermore, the establishment of diplomatic partnerships indicates that China will not set up military alliances with Latin American countries. Political ties with regional countries are also shallow. China and Brazil just started deepening their bilateral political ties, for example. China’s political relationship with Cuba has only limited effect and is not stable. Meanwhile, Chinese culture has little influence in Latin America and this phenomenon is unlikely to change in the short run. First, identifying priority partner countries. CELAC has 33 member states. China has neither the capability not the responsibility to develop deep investment and trade relations with each member state. It can only select economic cooperation (mainly referring to investment) with key countries based on its own national interests. The governance capability, economic development level, and legal system is different in each Latin American country. Some countries have weak economic structures, such as a high dependence on exports, particularly of a single product, or have budget shortfalls. Generally, these kinds of countries with financial “black holes” are not considered as key cooperation partners. Based on purely economic logic, Uruguay and Trinidad and Tobago should be regarded as key investment destinations for China. In terms of overall national strength, China should pay attention to Argentina. If the key factors are political stability, economic potential, and resources, China may prioritize relations with Bolivia, Ecuador, and Chile. Second, identifying priority cooperation fields. Some countries are potential energy partners, such as Ecuador, Venezuela, and Trinidad and Tobago. Others — for instance, Chile and Peru — can cooperate with China on mining projects. Costa Rica and Nicaragua can work with China on special economic zones; some other countries can be regional trade hubs, such as Mexico and Chile. Beijing can also expand political relations with Brazil, mainly through BRICS, and explore the establishment of a free trade zone with Mexico. Third, paying attention to risk control. No single Latin American country is an indispensable economic partner for Beijing, given that China is a super economy. It is not necessary for China to invest too many funds and resources into any certain state. The majority of China’s oversea investments come from large state-owned enterprises, who are more capable of resisting political risks than their Western counterparts. However, even China’s SOEs cannot fully avoid political risk in Latin America. Thus, it is necessary to conduct regular risk assessments and set up a “stop-loss point” for investments and loans in Latin America. Take Venezuela as an example – China’s investment and loans in that country amount to more than $70 billion. Considering the state’s political and economic situation, it is inappropriate to further increase the amount of investments and loans. In short, China should guard against bad debts. CELAC cannot play a significant role in China’s global diplomatic plans; for China, it is less important than Africa. China-Latin America engagement mainly focuses on the economic aspect and the potential for bilateral trade. Latin American countries will emerge as new destinations for China’s rapidly growing foreign investments. However, Chinese investments in Latin America mostly comes from national funds, which are implemented by state-owned enterprises, the State Administration of Foreign Exchange, and the sovereign wealth fund. That in turn implies that a significant proportion of these funds come from foreign exchange reserves; thus China cannot be too cautious in emphasizing economic rationality and risk control in these investments. In order to improve financial efficiency, China may also found Sino-Latin America development funds based on market-oriented operations to increasingly support private enterprises when they go to Latin America. Beijing is not expecting to make a fortune on China-Latin America economic and trade relations, but neither can it suffer a big loss. China can tolerate short-term financial costs but cannot ignore the long-term economic balance; it can properly take political considerations into account, but cannot be purely politically-driven. In short, when it comes to Latin America, China has the money, but must be cautious when it comes to spending. A previous, Chinese-language version of this piece appeared on the Chinese website of the Financial Times.